From Illiteracy to Literature presents innovative material based on research with ‘non-reading’ children and re-examines the complex relationship between psychoanalysis and literature, through the lens of the psychical significance of reading: the forgotten adventure of our coming to reading. Anne-Marie Picard draws on two specific fields of interest: firstly the wish to understand the nature of literariness or the "literary effect", i.e. the pleasures (and frustrations) we derive from reading; secondly research on reading pathologies carried out at St Anne’s Hospital, Paris. The author uses clinical observations of non-reading children to answer literary questions about the reading experience, using psychoanalytic theory as a conceptual framework. The notion that reading difficulties or phobias should be seen as a symptom in the psychoanalytic sense, allows Picard to shed light on both clinical vignettes taken from children’s case histories and reading scenes from literary texts. Children experiencing difficulties in learning to read highlight the imaginary stakes of the confrontation with the arbitrary nature of the letter and the "price to pay" for one’s entrance into the Symbolic. Picard applies the lesson "taught" by these children to a series of key literary texts featuring, at their very core, this confrontation with the signifier, with the written code itself.. This book argues that there is something in literature that drives us back, again and again, to the loss we have suffered as human beings, to what we had to undergo to become human: our subjection to the common place of language. Picard shows complex Lacanian concepts "at work" in the field of reading pathologies, emphasizing close reading and a clinical attention to the "letter" of the texts, far from the "psychobiographical" attempts at psychologizing literary authors. 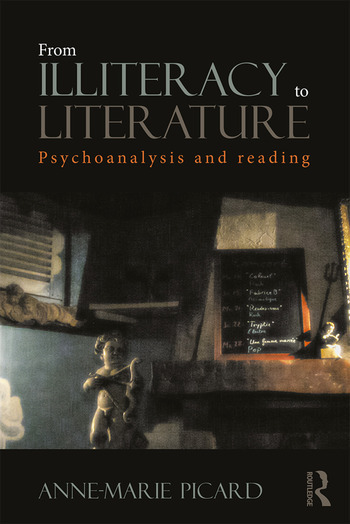 From Illiteracy to Literature presents a novel psychodynamic approach that will be of great interest to psychotherapists and language pathologists, appealing to literary scholars and those interested in the process of reading and "literariness." Introduction: Dé-lire : the unconscious factors in reading. I: Coming to Reading. II: The Reading "Thing" and the Reading Body. III: Dé-lire - The Poets’ Dream. Conclusion: reading as a critique of maternal jouissance. Anne-Marie Picard is professor of French and Comparative Literature at the American University of Paris. Using a psychoanalytical approach, her research focuses mainly on French writers such as Colette, Sartre, Duras, Cixous, Angot and Houellebecq. "Why do we all forget how we learnt to read, but remember when we meet people who have trouble reading? Following a trajectory that brings us from symptomatic illiteracy to literature as the Symptom, Anne-Marie Picard sketches an indispensible (and hitherto lacking) general theory of reading. Bridging the gap between infantile dyslexia and high modernist literature, she offers us a Lacanian guide to the letter, or How To Read with psychoanalysis. "-Jean-Michel Rabaté, Professor of English and Comparative Literature, University of Pennsylvania. "This lively and audacious book explores the experience of reading from variety of psychoanalytic perspectives. If there is a time before reading, what makes reading possible - and what, in turn, can make reading so difficult or, for some, impossible? Drawing on a rich range of sources - literary, metapsychological and clinical - Picard shows not only that reading can never be taken as a given, but opens up new perspectives on both the intake of words and their inscription itself, moving from the scene of reading to that of writing. This thought-provoking book will appeal to students of psychoanalysis and literature, as well as to anyone who works with questions of literacy and language. "-Darian Leader, Psychoanalyst, Centre for Freudian Analysis and Research. "Drawing on a wide range of psychoanalytic concepts around the question of reading, Picard’s study sheds light on child case histories as well as exploring clinical vignettes from literary and autobiographical texts. Picard sets out to rethink and clarify some of the central features of the Freudian field: the results are compelling and original. "-Luke Thurston, Senior Lecturer in Modern Literature, Aberystwyth University; author of James Joyce and the Problem of Psychoanalysis (2004). "This book succeeds where many others have failed: it offers a true clinical approach to reading. Psychoanalytic concepts here are not gratuitously used for effect, they are tools to explain, clarify the mechanisms of reading and guide practitioners in their attempts to remedy reading difficulties. But this book is also a good read, it is full of unexpected and surprising sections of literary criticism which not only offer the opportunity to re-read (or read) exciting texts but also enjoy Anne Marie Picard's rich and original interpretations."-Dr. Lionel Bailly, University College London, Psychoanalysis Unit.